Driven by the Landfill Directive (EC/99/31/EC), recent years have seen a dramatic increase in the use of biological treatment waste processing across the UK. From an almost standing start fifteen years ago, over 300 local authorities, all across the UK, now operate separate collection schemes for compostable materials (garden and food waste). There are a number of different methods of collection including wheelie bins, reusable bags, compostable bags and non-compostable bags. Source separation of materials is a key stage in most recycling processes, in particular composting, and is therefore a prerequisite of the UK’s quality specification for composted materials, BSI PAS 100, and the Compost Quality Protocol. Separating biodegradable wastes for composting at source not only provides the composter with a cleaner material to process but, given the weight of biodegradable wastes, it also helps local authorities reach their recycling targets and landfill allowances for biodegradable wastes. Compostable bags which are certified to EN13432 are not only acceptable inputs into BSI PAS 100 composting process but they also reduce processing time at the composting plant as they do not need to be split and removed before entering the treatment process. Over recent years, garden waste collections using wheeled bins have become wide-spread across the UK yet many of the schemes are only available in certain areas, often less than 75% of households. Restricted access to such collections not only has an impact in terms of the amount of biodegradable waste being diverted from landfill but also impacts on residents who do not receive the service and can feel disgruntled. There are many factors which limit where such collection schemes can be implemented including: access to gardens e.g. steps, lack of storage space, collection vehicle access down narrow or dead-end streets and cost. In addition, there are numerous areas where wheeled bins are not acceptable not just due to the reasons already given but also the local authority is a picturesque area and thus bins are not visually acceptable or areas covered are too large to be able to service so many bins. The perfect solution for such circumstances is to provide residents with certified compostable garden waste sacks. Such bags are easy to distribute, store and are ideally suited for free and charged schemes. They are available in a range of sizes, able to be printed according to local demands and meet health and safety requirements. 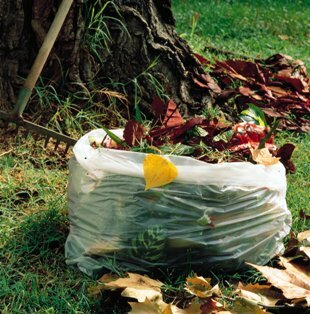 By its nature, garden waste is biologically active and aggressive, so it is vital that collection bags can withstand high levels of biological activity whilst maintaining their integrity until their collection. They also need to have a high resistance to piercing, ripping and tearing. Given the range of compostable materials on the market and their different in performance in different applications specifying a bag which is fit for purpose can be difficult. To help resolve this issue, the Belgian certification body Vincotte has developed a testing scheme called VGS which incorporates both compostability and bag integrity. Bags which are already certified to EN13432 are filled with up to 18 Kg of active organic waste and acclimatised at 22 oC for 3.5 days followed by 40 oC for a further 3.5 days and then 20 oC for a further 24 hours. After this bags are subjected to drop tests and if they do not tear then they achieve VGS1, the cycle is continued for up to five weeks depending on the level required. So, a bag which has VGS2 will be suitable for garden waste collected on a fortnightly cycle. Increasingly Local Authorities are looking at developing food waste collection schemes that not only provide a service but also enable high levels of captures. The two go hand in hand; a good service encourages high participation with high capture and vice-versa. 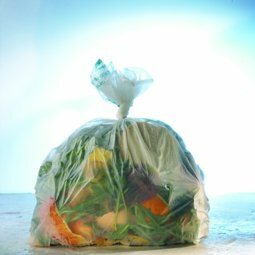 Whilst food waste collection is in its infancy in the UK, trends are already beginning to appear especially with regard to capture and participation. There are a number of different ways to collect food waste: separately with caddies and free or paid-for certified compostable liners, separately with caddies and no liners (food wrapped in newspaper or loose), or together with garden waste. The impact of these different systems is remarkable and if the intention is to encourage capture of food waste then it is beginning to become clear that weekly separate collection using caddies and liners along with strong ongoing communication are essential. Currently there are ~65 local authorities who are trialling or have rolled out separate collections of food waste and a similar number who collect food together with garden waste in wheeled bins. Research is showing that those who co-collect are capturing significantly less food than those who collect separately. On average the separate collections using liners are capturing 2.5-3.5 Kg / hld / wk and have participation levels of 60-85+%. Where food and garden waste is co-collected, the amount of food waste captured is typically 0.5-1.5 Kg / hld / wk – there is no reported data on those who actually separate out food but the very low captures suggest <25%. The difference in food waste capture between separate collections and co-collections is clear but what is also becoming clearer is the role that caddy liners are making. Reviews of UK based food waste collection schemes has identified that public perception, particularly of the “ick” factor as a potential barrier to participation and thus capture. Kitchen caddies (5-10l) have been shown to substantially increase participation and recovery in such schemes. However, the vast majority of the food waste schemes currently operating in the UK use solid caddies with or without liners, which may slightly reduce but not remove the “ick” factor. The vented kitchen caddy system which combines the caddy with a compostable bag has increased transpiration capability providing a number of key benefits over a solid caddy. By allowing the food waste to ‘breathe’ the material starts to dry out and weight loss through evaporation can be as high as 30% in just a few days. This is extremely important in a kitchen as it prevents the material from turning anaerobic and thus odour is significantly reduced. In addition the condensate that can accumulate at the bottom of traditional closed caddies is avoided. The convenience of the system means that once it is full, the bag of food scraps can simply be removed and replaced without the need to wash the caddy. The vented system is now considered state of the art across much of Europe and is increasing in prevalence in the UK and the key to its success as measured by capture and public participation, is convenience. The benefits of systems which use compostable liners extend beyond the household to the collection, transport and composting systems where uncontained, fermenting food waste can lead to odour and health and safety issues. From a local collection authority viewpoint one of the key benefits of using compostable bags comes from the increased efficiency of collection. Since the bags can simply be lifted out of the outdoor caddy / bucket, collection operatives can visit many more properties before returning to the collection vehicle. An example of this in the UK is in Preston where they have no problems completing their busiest round – 1753 properties / ~60% participation – in a day which they estimate to be twice as efficient as the next best separate food collection scheme which does not use bags. Truly compostable bags have enormous potential, especially in separate food waste collection schemes and will become progressively more widespread as the demand for sustainable solutions increases. Maintaining and improving both efficiency and quality is key to the entire biological resource industry, using bags certified to EN13432 will help reach both these goals.